You might think that beekeeping is a practice about as far removed from internet sensations and hi-tech innovation as you can get. Think again. 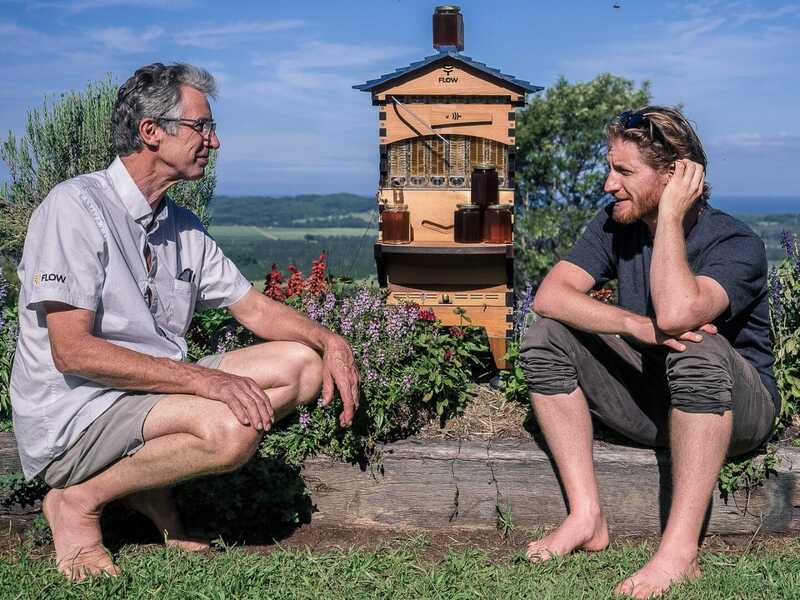 Coastbeat meets Flow Hive’s father and son team who have taken beekeeping into the 21st century. Flow Hives’ ground-breaking invention represents the first major change to honey farming since 1851 – the first non-invasive way to harvest honey and the most successful crowdfunding project to date, all from a kitchen table in Bangalow, Northern NSW. I met with the inventors behind Flow, father and son, Stuart and Cedar Anderson at their Newrybar base and discovered, apart from more bees than I’ve ever seen before, a family company thriving on connection, community and of course, honey. Connection is the key word in this story. Bees communicate through connection, exchanging pheromones as a part of their constant activity and through their intricate dances. Community connection supported Stewart and Cedar when they realised that the phenomenal response to Flow Hives crowdfunding meant they needed help. 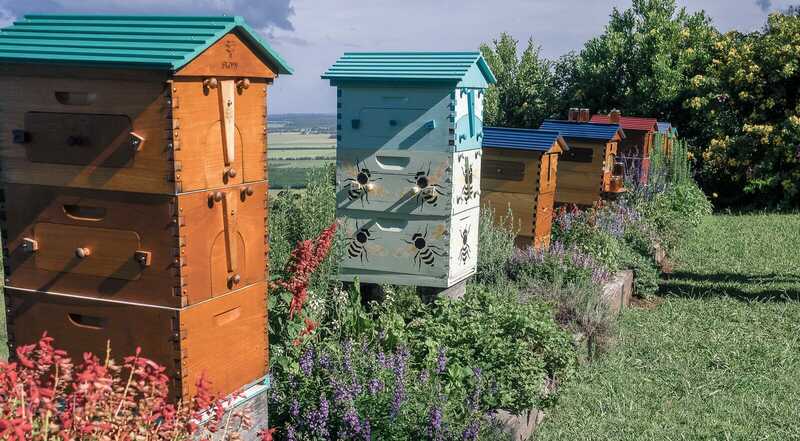 Now, it is a connection with beekeepers across the world, establishing the first successful global beekeeping company, that is the marker of Flow Hives. But, it all began with family. Stewart: My dad kept bees. I suppose that’s where I first became interested. Cedar: My dad keeps bees too! Cedar: And his dad keeps bees! Cb: So, will your son be a beekeeper? Cedar: I hope so. And my daughter. Extended family are all involved: we’re lucky to have a lot of talented people in our family. In three years we’ve gone from the two of us to 45 people. Flow Hives started, as many innovations do, with a problem. Cedar had been managing 30 hives as a commercial venture. He loved beekeeping but found the work unnecessarily taxing and the stress to the bees disturbing. After 10 years of experimentation, it was connection that held the key. Cedar describes their eureka moment when Stuart held up his hands, making the shape of a honeycomb cell, fingertips to fingertips, thumb to thumb. Then he dropped one hand a fraction lower, making a crack between his thumbs that, transferred to a honeycomb cell, represented a channel for honey to flow through. But how to make real their idea? For Coastbeat readers who don’t already know, Flow Hives is renowned as the most successful crowdfunding attempt in the world, ever. Within minutes of launching their project online they received millions of expressions of interest. Cb: How did you do the crowdfunding? Cedar: They put together the Facebook page that got us up to 1,000 likes with generic bee content so we had something to launch. We dropped the video and got a million views in 30 hours. Life has never been the same since! Stuart: I was thinking ‘who are all these people?’ I mean, I’m used to the population of Lismore, but a million? Where did they all come from? Cb: You went global and viral? Cedar: Instantly. It was share, share, share, share and a week later there were 70,000 people who had contacted us, wanting to know more. Cb: And then many, many people pledged? Cedar: They did. We thought our target market would be existing beekeepers. What we didn’t realise is that we were creating a new market: about half of our 50,000 orders are to brand new beekeepers. Stuart: Yes, and we’re very proud of that. But there was a pause, says Stuart, an ethical pause to assess the impact of their invention. Stuart: We had to consider if this was a good idea for bees, for the beekeepers, for the world. The best thing, I thought, was that if more people could keep bees then more people would understand our interdependence with myriad flora and fauna. Cb: Now that Flow is established globally, how has the reaction been from the professional beekeepers? Cedar: And mixed. Although we do have some professionals using our Flow Hives, many are sitting and waiting. Stuart: The crowdfunding exploded us onto the scene. We were completely unheard of in the beekeeping world and suddenly there we were, worldwide with a brand-new invention so we did get backlash from some beekeepers. And some had genuine concerns, that we shared. Cb: What were your concerns? Stuart: We had to ask: what if some of the people were buying these hives in the initial rush, like getting a new kitten at Christmas? We were very concerned and that’s part of the reason our website is so comprehensive in terms of information to encourage beekeepers to learn the craft of caring for bees properly. Cb: Have you found the ‘kitten at Christmas’ attitude? Cedar: Also, people who make direct contact with us to ask things like: “I’ve seen a beetle in my hive, what do I do?” They are hungry for learning and information. You’ll get a lot more good beekeepers from what we’ve done, which we need. There was something like 200,000 beekeepers in the USA 40 years ago, but the numbers have halved; it’s a concern that new generations aren’t taking up the art of beekeeping. So for Flow Hives to be increasing that number significantly, with over 50,000 orders currently, we feel very proud. Cb: I imagine that with getting all this information online you’ve learned a lot about beekeeping too? Cedar: Yes. And the more you learn about beekeeping the more you understand that there’s so much more to learn! We get a lot of information back from the world about different ways and we’re always learning. There’s a lovely global conversation that’s sprung up around our invention. And around that grows a community where people are talking bees from a global perspective and with that comes every single opinion there is. They say that for every two beekeepers you get five opinions! Stuart: Beekeepers are a wild and wonderful bunch! Cb: Why the Northern Rivers? Stuart: It’s our home. A lot of people, myself included, moved to this area because they wanted something different and that means that this area is innovative, populated by people who are willing to take risks, who have pride in difference and therefore, have that kind of energy. It’s no surprise that Flow came out of that. Flow Hives are strengthening their connection with community by bringing in the hi-tech to keep manufacturing locally, as demand for their hives grows. 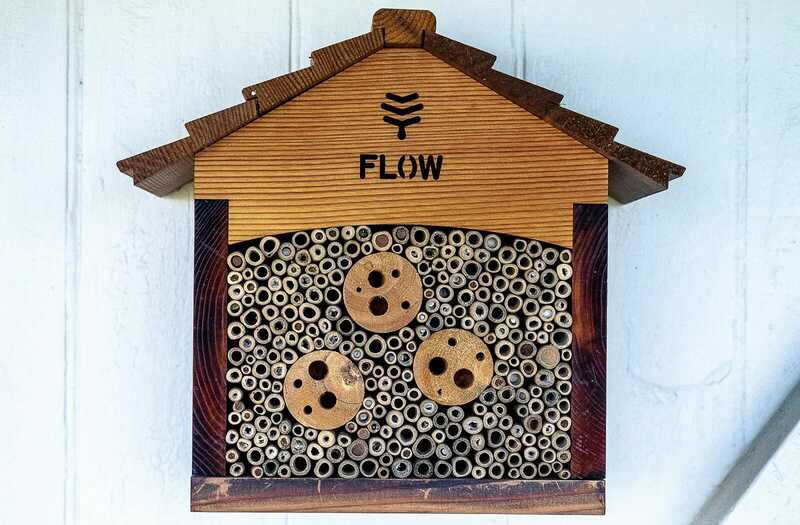 Stuart and Cedar have redesigned their hive to include 14 new improvements and made a limited release breeder box, using offcuts to reduce waste.